After learning about Logo Design Tips which I really find it very interesting. I would like to share to you something about one of the Christmas Gift I got from my sister in law. I was way clueless about the gift she would like to give me for I never give her any wish list for last Christmas. I know I have given her too much to think. I wasn't expecting that she will give me something that is beyond my expectation. She knew I love to cook. I have passion of learning to cook different dishes. And since I was born in Philippines and being a Filipino that is away from the food you used to eat it is very much difficult to make something similar to those foods. However, as she is a clever girl and wouldn't waste money for something usual. She instead gave me this cookbook. It's basically Filipino dish that has American ingredients. 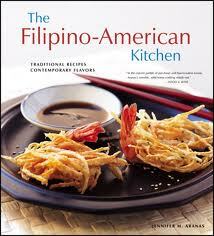 This ingredients are substitute in order to cook Filipino dish in an American ingredients. Lovely huh. I haven't make anything from this cookbook yet but I'm eager to make soon.